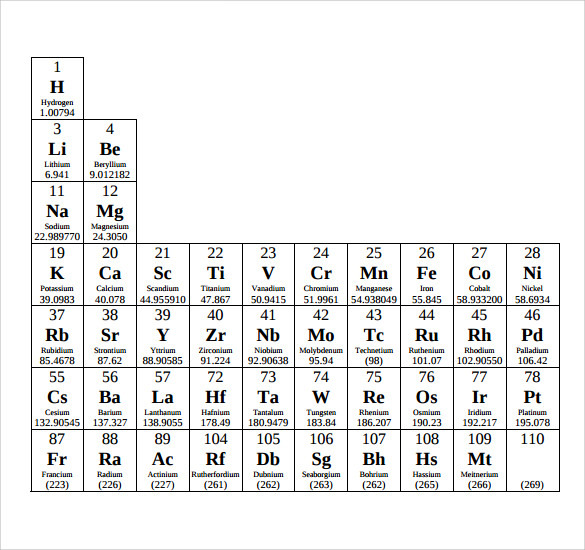 This is an extremely simple chart that you can use and it has the names of all of the elements as well as other required information. 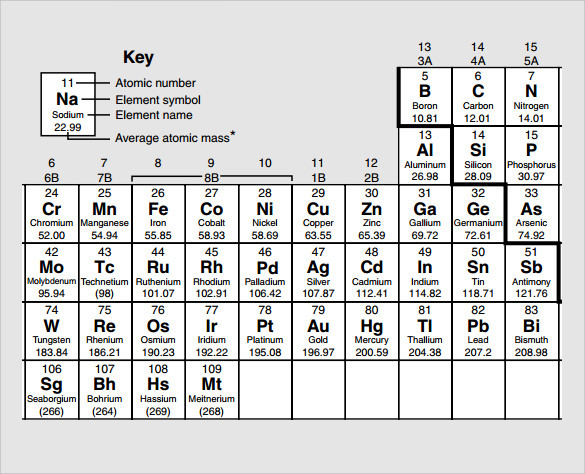 They are color coded depending on the type and it includes the names, symbol, atomic mass, atomic number and much more. This is an extremely simple option and all of them are shaded in different colors. It has them in rows and columns and all of the required information is there. 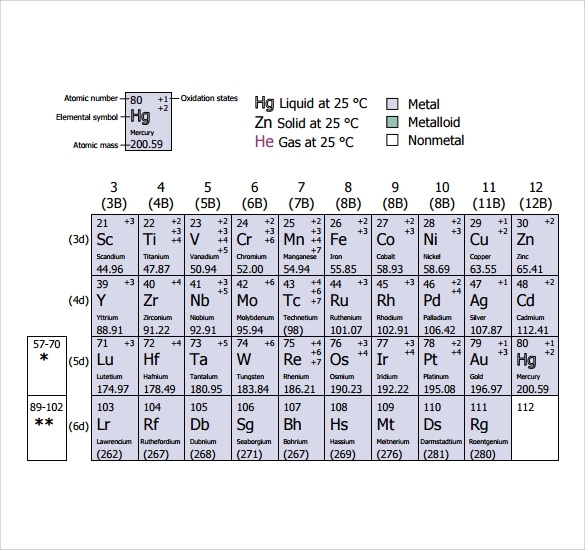 It has the information about the elements name, atomic mass, atomic number and the make-up. This is another simple option that most people are familiar with and the elements arent colored, but the background here is gray. 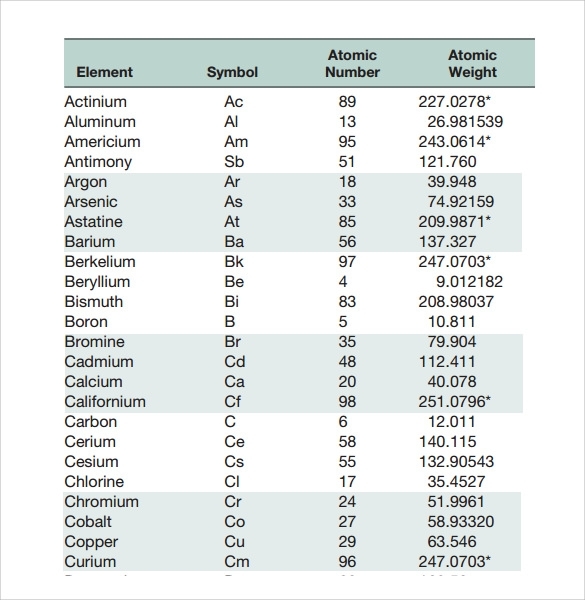 There is a key that shows you how to read the element’s information, including the atomic number, element name, symbol and average atomic mass. If you are looking for a chart that has the electrons, protons and neutrons, then this is the right element chart template to look for. 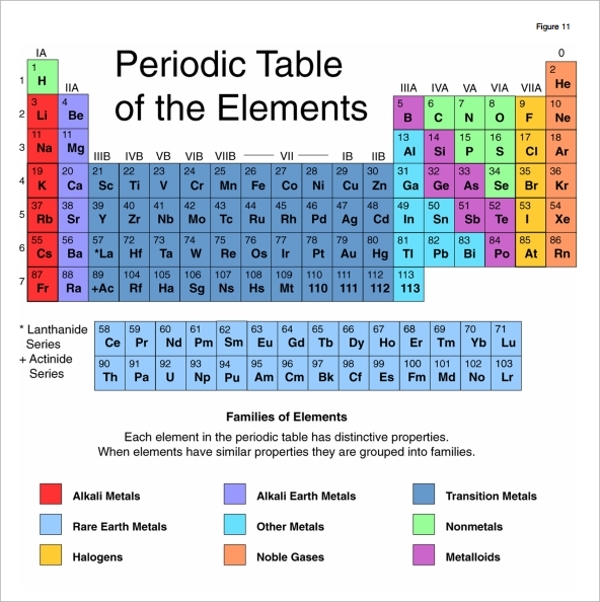 It also has the elements color coded depending on whether or not they are metal, nonmetal or metalloid as well as different font colors to determine when the element will become liquid, gas or solid. 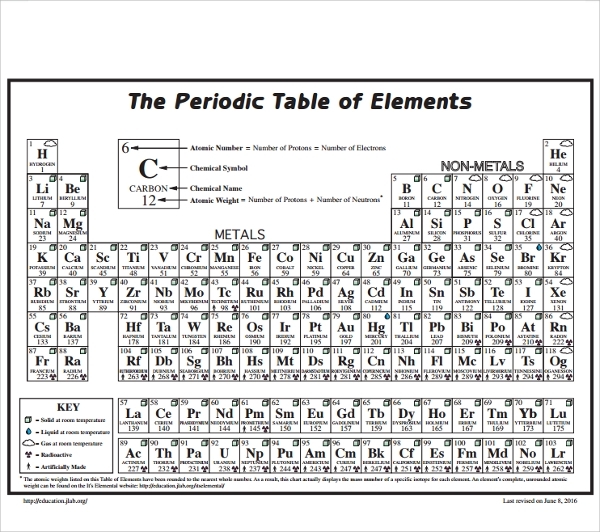 It also has information about the oxidation states, the atomic number, the atomic mass, symbol and name. This is a PDF version of the element chart template and you can download it and use it for all of your needs. It has the same information, but it is in the normal format, including in rows and columns. It has the name of the element, the symbol, the atomic number and the atomic weight. This is the same style that is typically used in most schools and is something that you can print and use at home. This is a great option for those who are looking to learn more about the various elements as well as some clues about each one to help them remember. It has the name, the symbol, atomic mass and the atomic number, but this time they are in order of the atomic number, instead of alphabetic. There are also some clues to help you determine which each one is and how to figure it out. This is a different style of element chart template since it isnt in the row and column format, but instead it is just a list. 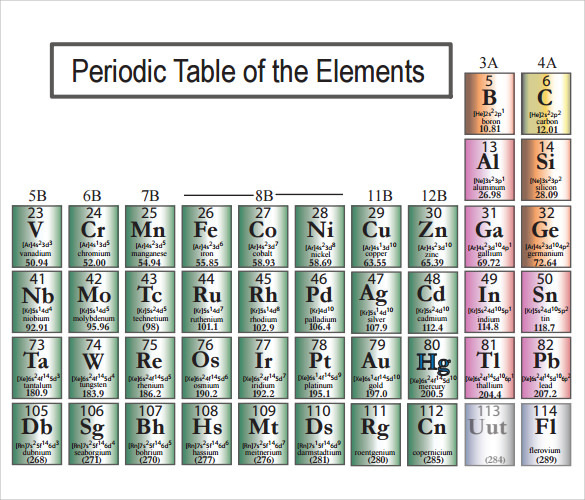 It is in alphabetic order and it has the name of the element, the symbol, the atomic number and the atomic weight. This is good for those want to be able to memorize it all without having to look at the chart that is typically used. 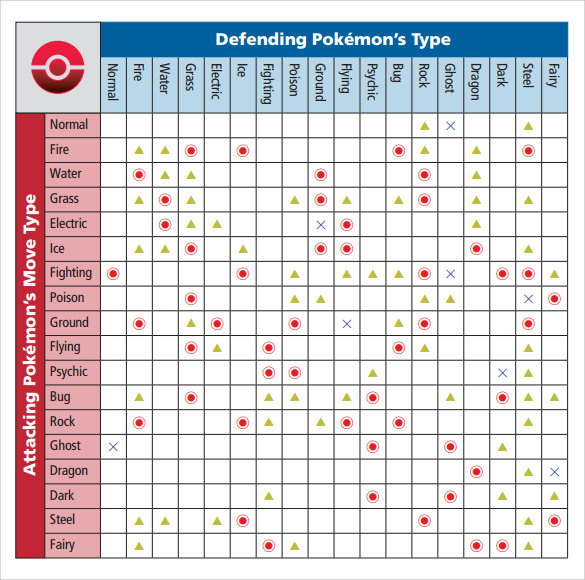 This one isnt like your normal science charts, but instead it is for Pokémon characters. It will tell you which are the best type of ‘attack’ to be used against the attacking character for the defending one. It will also tell you which ones wont work well, so it is good for anybody who loves to play the game, but aren’t well informed about what works well with each other. This is an extremely simple chart that you can use and it has the names of all of the elements as well as other required information. 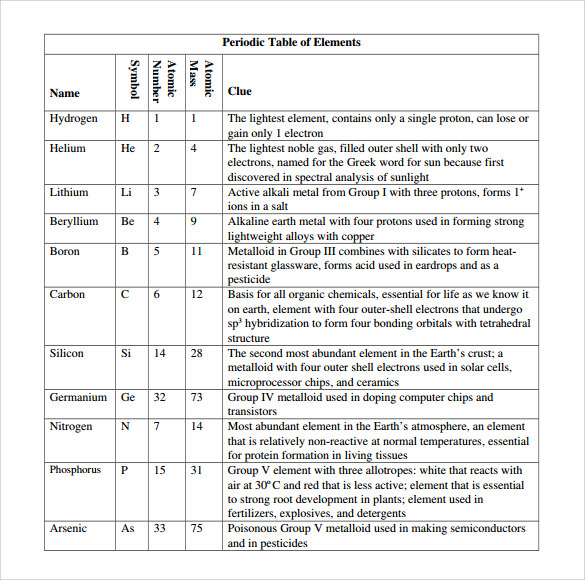 These well made element PH Chart Templates help you to create the best of periodic charts. 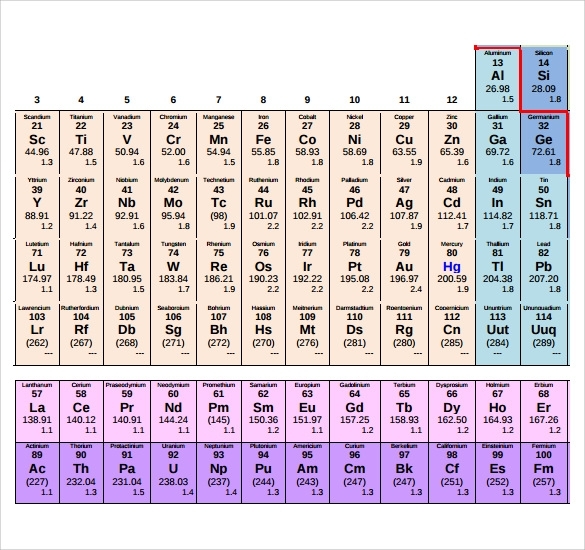 There are 17 Halogen elements and 18 noble gas ones. Here are just a few of the best charts that you can use for all needs.